Still using Opera Mini version 3? 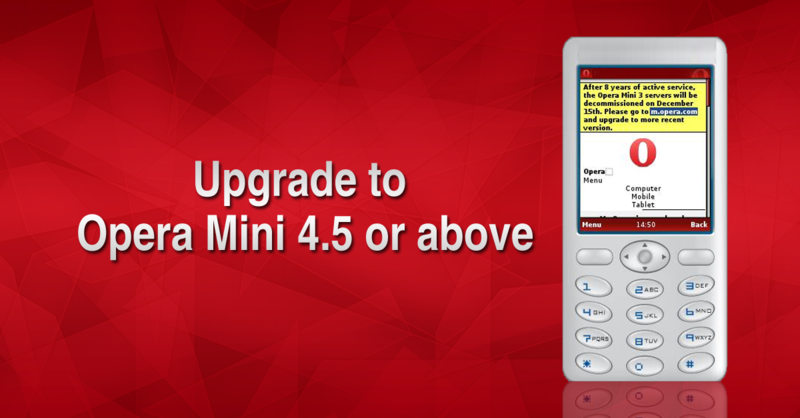 Hopefully you saw our notification to upgrade to Opera Mini 4.5. On December 15, we decommissioned the servers supporting Opera Mini 3 and apologize for any inconvenience this causes. We focus on speed and security in our browsers – two major reasons people choose Opera. To provide better security and a better browsing experience, we are encourage those of you still using Opera Mini 3 to upgrade now for free. 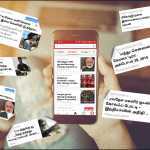 Opera Mini 4.5 is easy to use and works on almost all basic phones. Save data, browse fast. With Opera Mini’s data-saving technology, viewing a webpage may use as little as 10% of the data other browsers use. That makes Opera Mini perfect for those data plans charged by the megabyte. Less data also means quicker browsing. Pages load faster, even on poor connections. Manage downloads. Opera Mini’s download manager gives you better control of downloading new content to your mobile phone. Pause, resume and manage the download process, just as you would on more expensive phones or smartphones. Surf privately. Need to lend your phone to a Facebook-checking friend? Turn on privacy mode first. Then, Opera Mini won’t save any login names or data from your friend’s browsing. Once your friend is done, close the private tabs and all their personal data is removed. 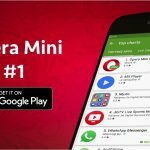 Get the new Opera Mini for free. Visit the m.opera.com/ on your mobile phone. It’s as easy as that.